We apply safe and friendly home treatments to eradicate and prevent bugs & roaches in your house, shed and entertainment areas. Cockroaches are some of the most adaptable pests in the world. There are over 3000 species of cockroaches distributed in different parts in the world. A cockroach can survive for almost for one month without eating any food and for two weeks without water. The female cockroach will mate only once but stay pregnant throughout their life. Cockroaches prefer to live in warm environments which is why they can often be found in houses. They also love to live in places where they can easily access food and water. Cockroaches can pose a risk to humans as they carry bacteria and can trigger allergy attacks. Cockroaches are very good at hiding. The best way to get rid of cockroaches is by denying them food and water, using poisoned cockroach baits, using pesticides and many other techniques. Cut off water sources & food, by plugging up leaking water pipes and hiding food. Cockroaches can hold their breath for up to 40 minutes and run at speeds of 4.5 kms per hour. They can even live for up to 7 days without a head! 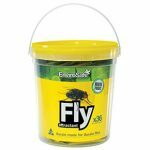 The EnviroSafeTM Fly Trap and attractant system is the result of years of intensive research to determine the most cost-effective and easy to use method of catching flies. the resulting design sets a new standard in fly catching, representing the best value for money product on the market today.